Non-stick pots and pans aren’t like your traditional cookware. They’re very prone to scratches which means they’ll no longer remain “non-stick” over time. So if you think your regular utensils will do, think again. Make sure to invest in utensils safe for non-stick cookware, too, to help your pans last longer. If you’re interested in buying utensils safe for non-stick cookware, then this list is for you. Here are what we think are the best utensils for nonstick pans. Great for starters, Calphalon 5-Piece Nylon Kitchen Cooking Utensil Set comes with a pasta fork, a slotted turner and spoon, a large scraper, and a solid spoon. They’re also BPA-free. 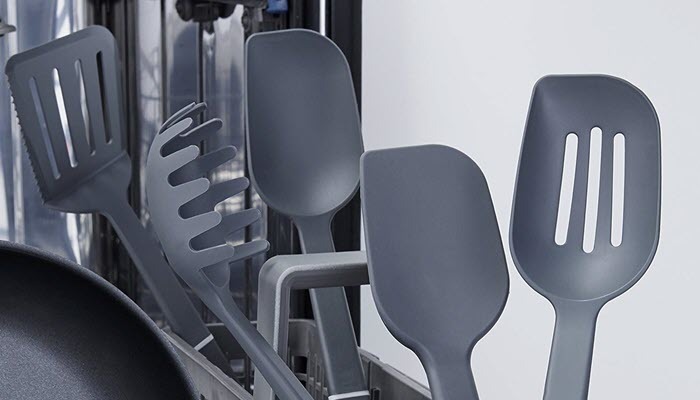 These utensils have heat resistance that can reach up to 400 degrees. This makes them great for making soups, sauces, or other recipes that need to be cooked for a long time. They have soft-touch and textured handles to give you a firmer grip. Plus, the utensils have uniquely-shaped corners to let you turn, flip, or serve any kind of food with minimum effort. Best of all, the utensils are very easy to clean and are dishwasher-safe. They also come in a very dark charcoal black color which we think adds a touch of elegance to any kitchen. 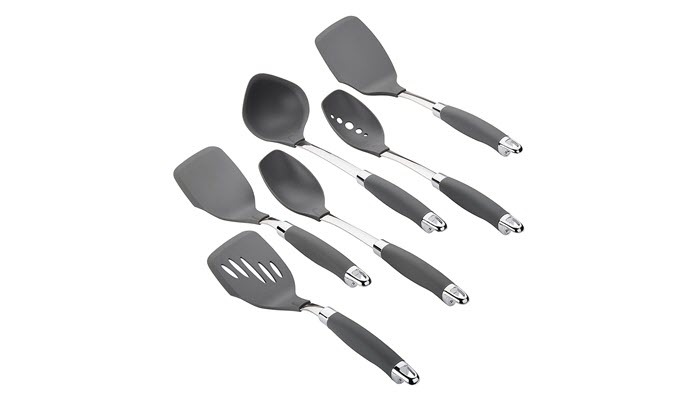 Make cooking time more fun with the Anolon 6 Piece SureGrip Nylon Nonstick Utensil Set. Each utensil is specially-designed to let you cook even the most complex dishes with confidence. 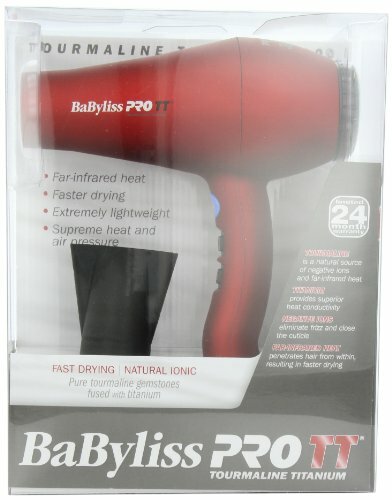 They’re made from BPA-free materials and have can stand up to 400 degrees of heat. These nylon kitchen utensils are very sturdy and are safe for non-stick bakeware or cookware. The edges of these utensils are angled to easily let you reach around, under, and in foods. They also come in a beautiful grey color that others claim is as good to use as serving utensils. However, we personally don’t recommend that. They’re also dishwasher-safe so clean-up is a breeze. And if grey doesn’t match your kitchen, it is available in 2 other colors to blend with your kitchen perfectly. 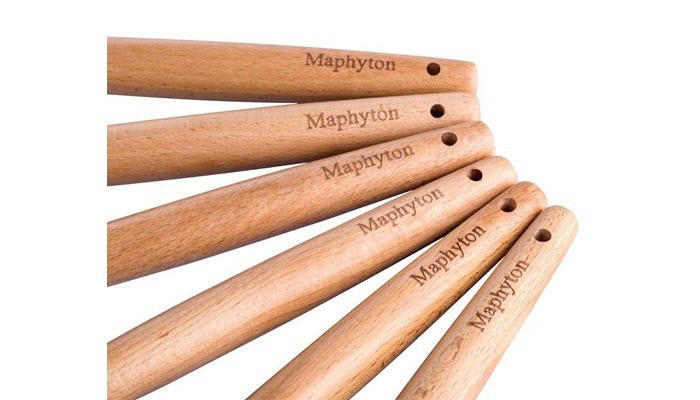 If you prefer classic-looking utensils, then the Maphyton 6 Pieces Silicone Kitchen Utensils Set is for you. 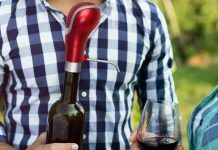 They come with a wooden handle with a hole in the end for easy storage. 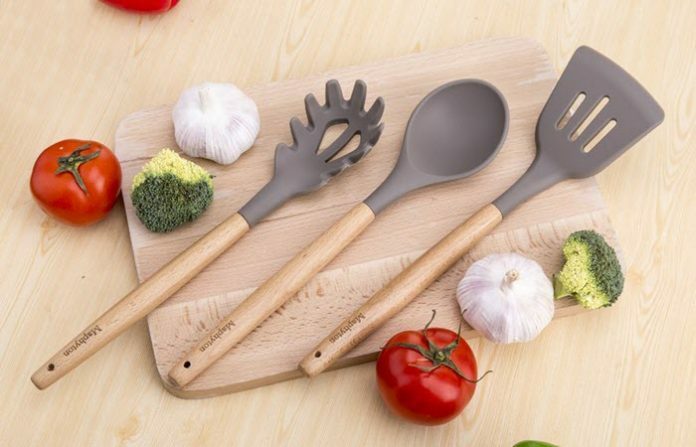 FDA-approved and BPA-free, these silicone utensils are soft and flexible. These make them ideal for non-stick cookware because you don’t have to worry about scratching or damaging it. These utensils are grey in color so they’ll easily fit any kitchen—unlike those bright ones. Also, this set comes in a stylish box so it’s a great gift idea to friends and loved ones. Or, you can have one for yourself, too! Clean-up also isn’t a problem. On top of that, they don’t stain with food and the handles don’t splinter when they’re in the kitchen sink—which means they’re made of high-quality wood. 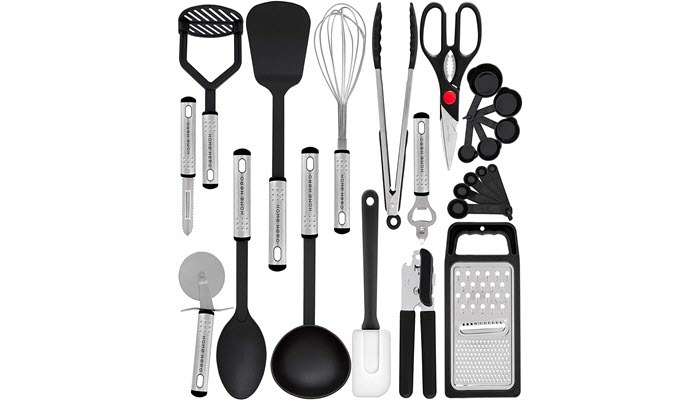 Any homemaker will love the HomeHero 23 Piece Nylon Cooking Utensil Set. It comes with a wide variety of utensils that lets you prepare literally any type of dish! These utensils have nylon heads so you’re assured that your non-stick pans are safe with them. Meanwhile, their handles are made from stainless steel for more durability. They are very lightweight—but not to the point they’ll feel like breaking after a few uses. They’re very easy to clean, too, and will still look brand new even after several washes. The set comes in its own box and each utensil is wrapped in individual plastics. Not something you’d expect from a cheap utensil set! Health-conscious folks stay away from fats like cooking spray and butter to grease their cooking pans. But, this can be very messy and most of your meal stick to the sides of your pans instead of in your stomach. This is why non-stick pots and pans are a blessing from the culinary gods. They have a slick surface to let you cook even the stickiest foods, like eggs or fish, without the mess. Also, you can do this without adding any type of saturated fats. However, they need different care compared to cast iron or stainless steel. For example, you can’t use metal utensils or abrasive tools to prevent damaging their non-stick coating. So, what should you use instead? Well, you have three options: wood, silicone, and nylon. Wooden cooking utensils have rounded edges and are easy to grip. These tools are gentle and soft enough that they won’t ruin your non-stick pans, yet sturdy enough to last a long time. However, some don’t prefer wooden utensils because they’re generally not dishwasher-safe. Also, making pancakes and crepes can be tricky when using a wooden spatula. And in hot weather, they tend to turn black—and they can look very unsanitary. Which brings us to silicone utensils. These utensils are popular since they are dishwasher-safe and safe under high heat. They don’t melt, don’t scratch surfaces to release harmful chemicals, and are thin to flip foods easily. But due to their flexibility, they’re not sturdy enough to handle heavy or thick foods. Meanwhile, nylon kitchen utensils are also dishwasher-safe but sturdier compared to silicone. They won’t scratch the surface of your non-stick cookware, too, but they can easily melt. What should you use, then? Silicone or nylon? It depends. If heat resistance is a priority, go with silicone. Silicone can withstand heat of up to 600 degrees Fahrenheit while nylon can only handle up to 400 degrees Fahrenheit. While most foods don’t reach 400 degrees, pans can. And if you leave a nylon utensil in a hot pan, the handle can melt. But if you love cooking thicker dishes like sauces or mashed potatoes, nylon is the way to go. Just make sure you don’t leave it in the pan longer than needed. 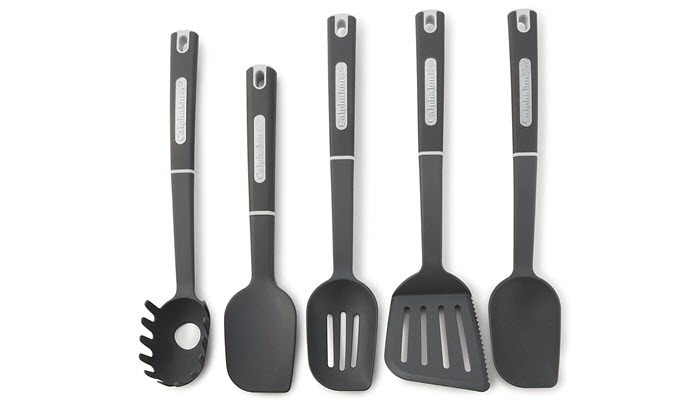 The Calphalon 5-Piece Nylon Kitchen Cooking Utensil Set is our choice as the best utensils for non-stick pans. It has everything you need and has a sleek design to go with any kitchen.